Khanom Khao Dom Mut is a soft and sticky Thai snack that is often served at special events such as parties and weddings. The traditional way of making them involves wrapping the coconut sweetened sticky rice in banana leaves, then steaming them. The snacks are eaten by hand, right out of the leaf, making it a convenient treat that can be eaten while walking around a festival or temple event. 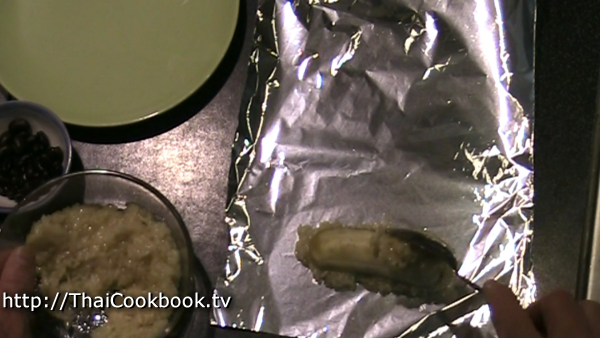 In this updated version shown here, the cook uses aluminum foil as the wrapper and serves the sweet and sticky rice, filled with banana, while hot, along with vanilla ice cream. True, it's not the traditional way, but it sure is delicious. 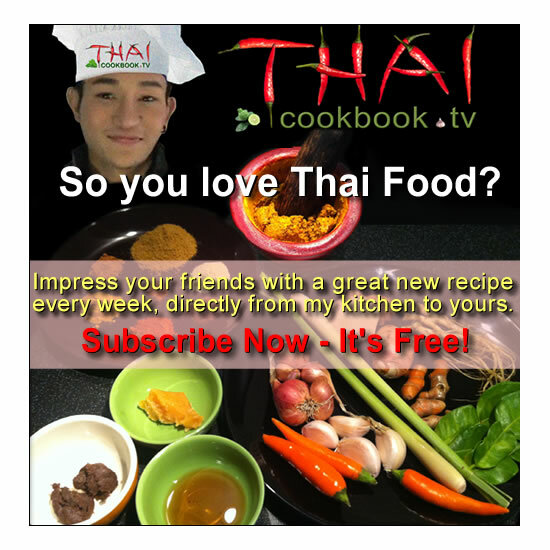 This easy to follow recipe show you exactly how it's done and your ข้าวต้มมัด will taste completely authentic. 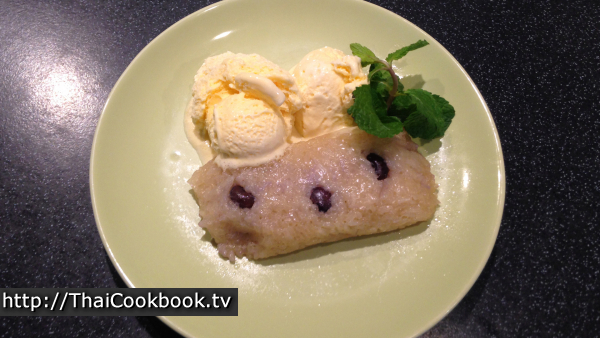 What's in our Sweet Sticky Rice with Banana Filling. 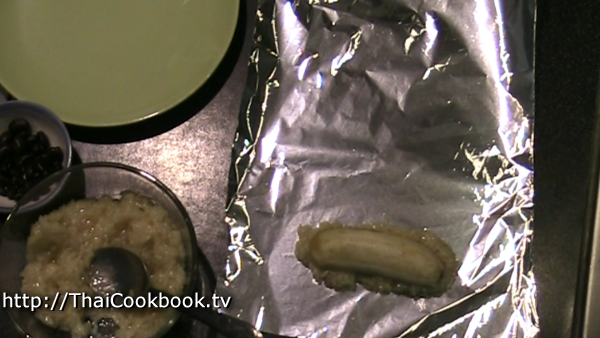 How we make our Sweet Sticky Rice with Banana Filling. 1) Soak the glutinous rice for at least 4 hours in enough water to completely cover it. Then, drain and rinse it well. 2) In a large wok heat coconut milk. Add the coconut sugar and salt, and stir in well. 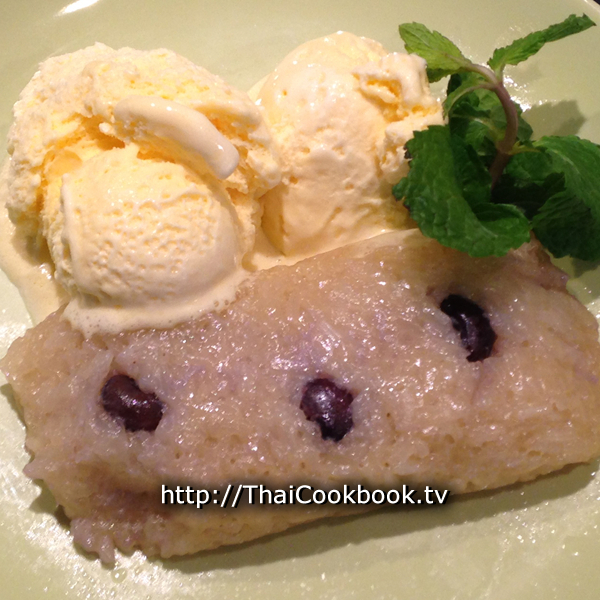 When the sugar melts, add the pre soaked glutinous rice to the sweetened coconut and stir well. Cook slowly for 20 minutes. Remove from the heat and allow to cool completely. 3) Wrap some of the sticky rice with half a banana and a few beans in a fold of aluminum foil so it makes a package like a burrito. 4) Place the packages in a steamer and cook for 45 minutes. Remove from heat, allow to cool completely, enjoy. 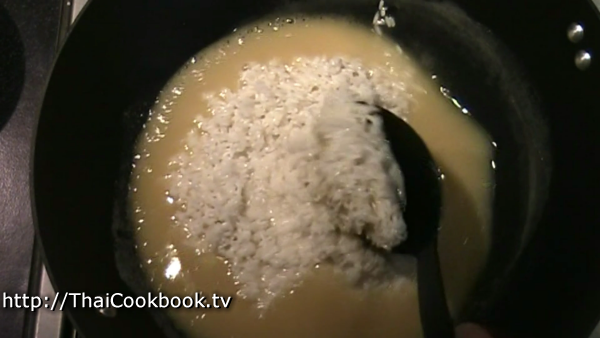 Soak the glutinous rice for at least 4 hours in enough water to completely cover it. Then, drain and rinse it well. Cut the bananas in half lengthwise. 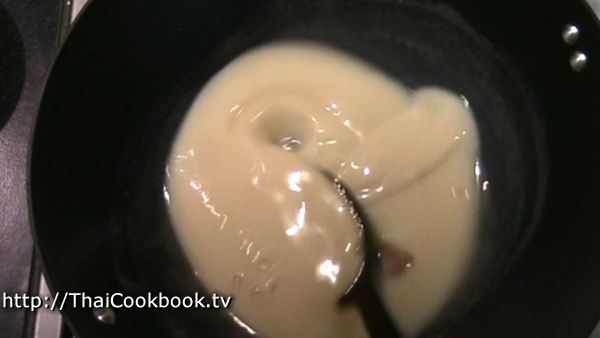 Divide the coconut milk into 2 portions: 1 1/2 Cups and 1/2 cup each. It usually takes about 1 1/2 cups to cook the rice, but you may need more so reserve 1/2 cup just in case you do. Cut 6 sheets of aluminium foil about 12 x 12 inches. In a large wok or frying pan, slowly heat the 1 1/2 cups of coconut milk over low to medium burner. Add the coconut sugar and salt, and stir in well. 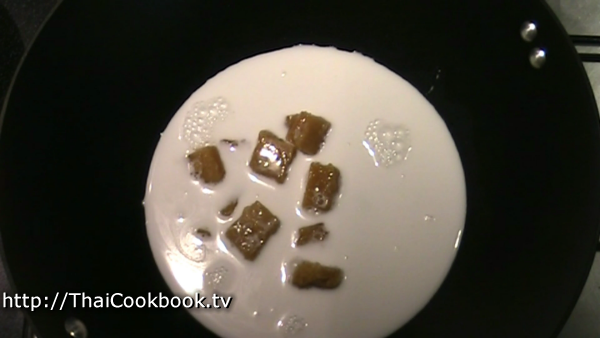 Keep the heat low and just stir until the sugar dissolves and the mixture is thick and bubbly. Add the pre soaked glutinous rice to the sweetened coconut and stir well. Cook slowly for about 20 - 30 minutes. Keep the heat low so the liquid doesn't evaporate too quickly. You need to cook it long enough for the rice to get soft. Test some of it. It should be chewy and not hard. If it isn't done, you may need to add more coconut milk and continue cooking for a while longer. 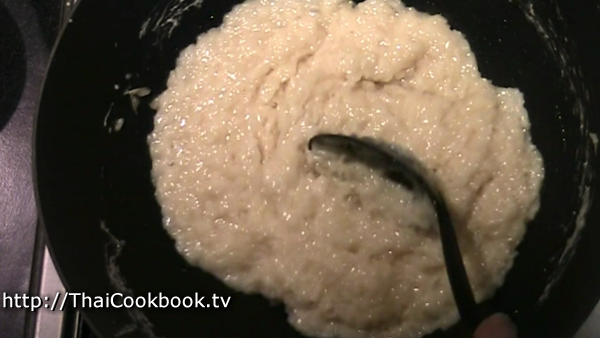 When the rice is soft and chewy, and all the liquid is gone, then it should look a little like cooked oatmeal. It will be a big sticky pile of rice. Turn off the burner and let it cool completely in the pan. The best way is just to cover it with a towel and come back a few hours later. Lay the sheet of foil on the counter. Lay 3 or 4 black beans in a row, then spoon a small amount of the cold rice mixture on top, until it forms a little log. Put half a banana on top and press it down so it flattens out the rice a little. Spoon more rice on top of the banana and place more beans on top like you did on the bottom. 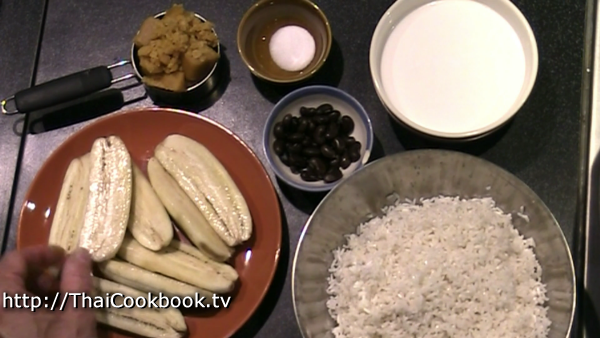 Now you should have a log of rice that has a banana half inside, and a few beans on the outside. Fold the foil over, sealing the snack inside, the way you might if you are making a burrito. Fold over both ends well to completely seal it up. Do the rest of the rice the same way until you run out of it, or run out of banana. You should get about 5 or 6 packages, but maybe more or less depending on how big they are. Place the packages in a steamer and cook for 45 minutes. Let them cool down all the way if you plan to eat them as snacks either now or later. You can leave them out, still in the foil, for at least a couple of days. If you put them in the refrigerator they get hard, but still taste great. 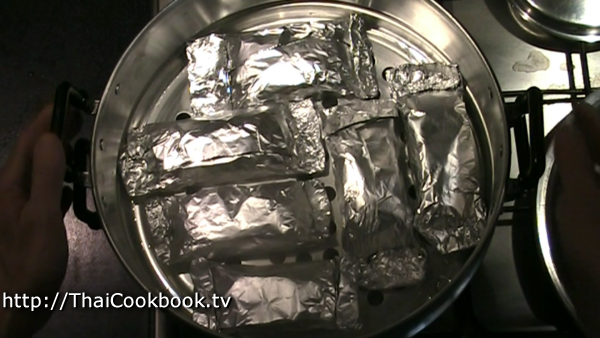 You can reheat them in a microwave - take the foil off, or steam them again with the foil on. To make a nice dessert, serve while still very hot or reheated, along with some vanilla ice cream. Garnish with a little mint. 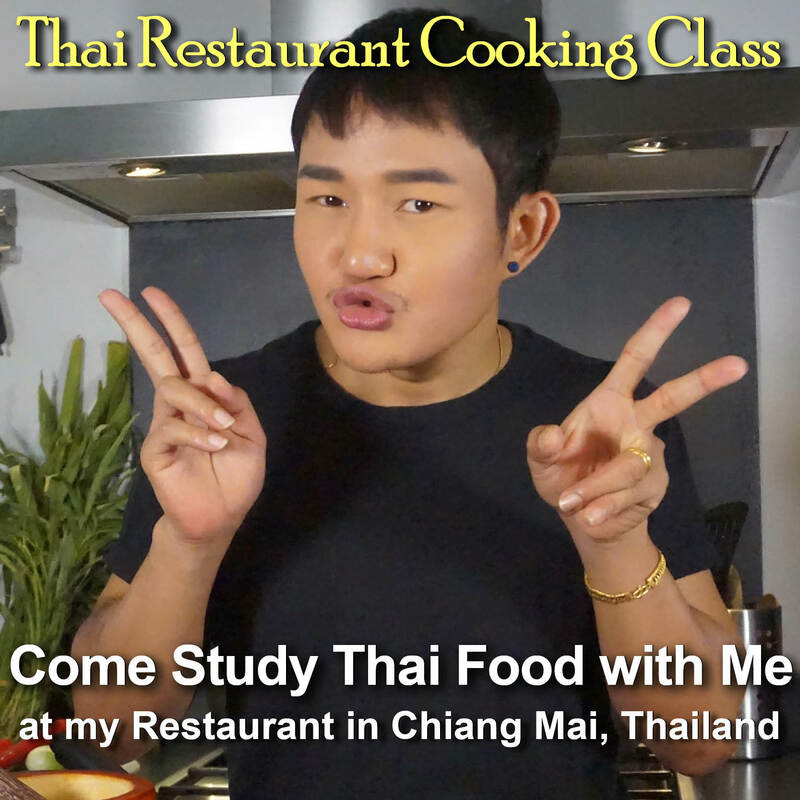 Note: This recipe takes a long time to do, but you can easily do it in 2 sessions by cooking the sticky rice first and leaving it to cool completely (overnight?) and then coming back to steam the snacks.